A surprise, whenever you go there and however many times you have been there already. 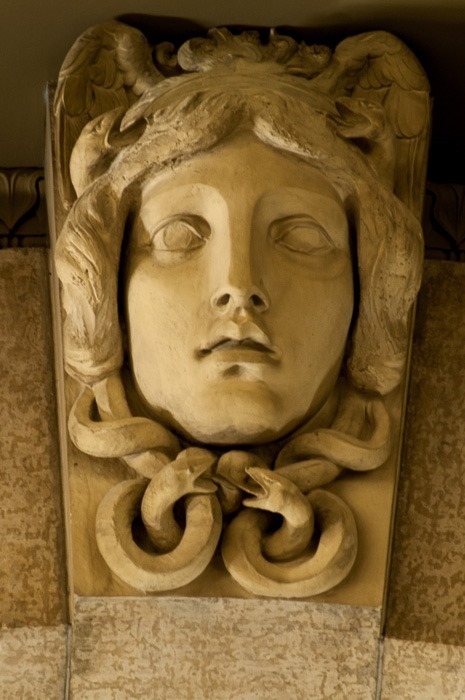 Also, surprising is the ease with which you can go inside Manitoba’s government building with a camera, bag and tripod. No questions asked about the tripod, you just walk in. I guess that every photographer will be so much in awe inside the building that he will completely be protective about everything he sees. 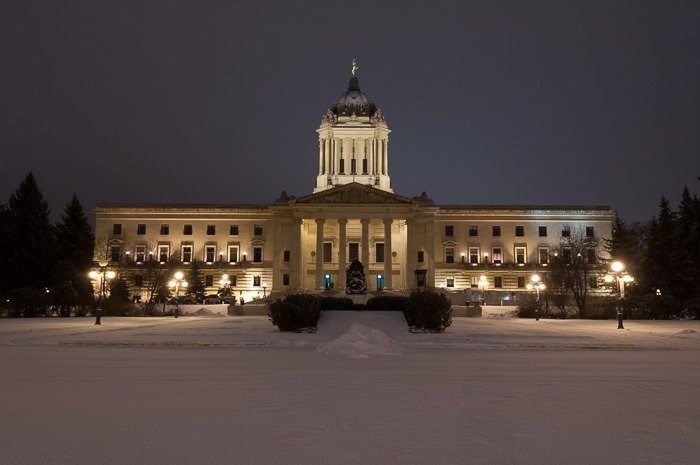 The lead picture of this post is the Legislature from the outside, during a cold night. 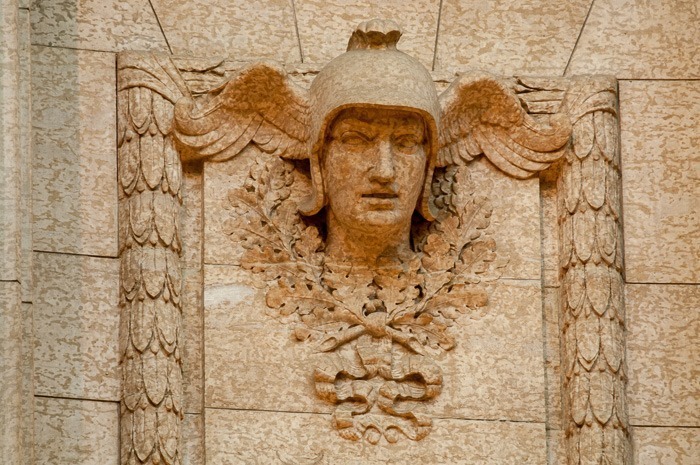 The building was erected during and shortly after World War I, the statue on the top was gilded in the beginning of the 1950s. After that, he got the nickname “Golden Boy”. Now what about the inside? I have already blogged about the Leg before, but I never had the chance of getting close to the far away details. This time I went in with a 300mm lens and a tripod to capture them. The stairs have rings. 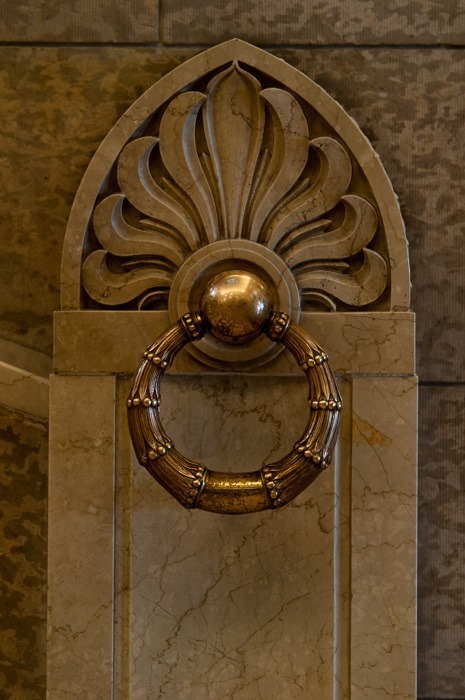 Sounds pretty useless, but it is possible to block off the central stairs with a rope (a velvet rope of course) and thus protect the upper floors from visitors. We all know about the Canadian Poppy, still used every year to remember World War I and the fallen heroes of that time. 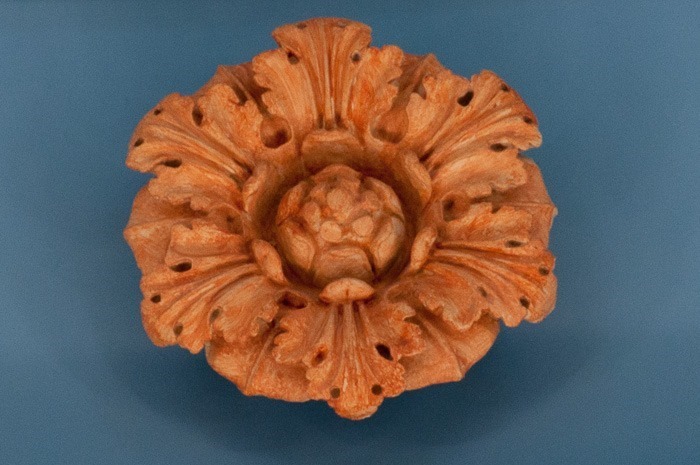 This poppy lives high above the ground in the round ceiling of the dome. Lowering the camera, the busts of several guards. Since all the building is made out of Tyndall Stone, the mottled surface seems to mask the details a bit. From further away, it looks like you get very grainy or noisy pictures. But look at the intricate details! Every light fixture is highly decorated. Again, the picture looks grainy and noisy, but it is only the Tyndall Stone responsible for that. 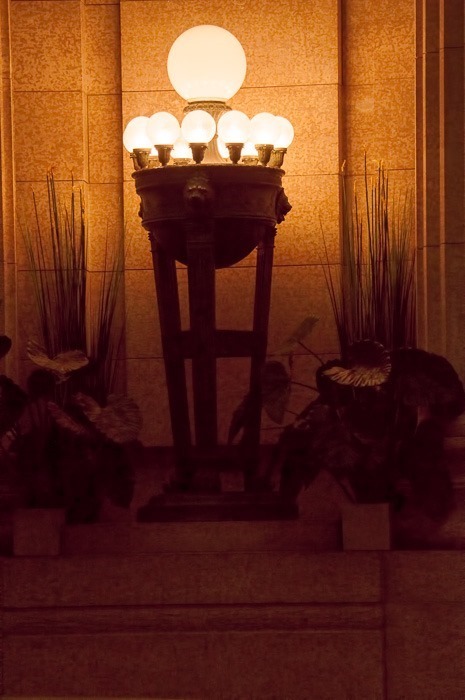 This reminds me of the flame holders of the old Roman amphitheatres in Europe. Except that the flames here have been replaced by electrical lights. 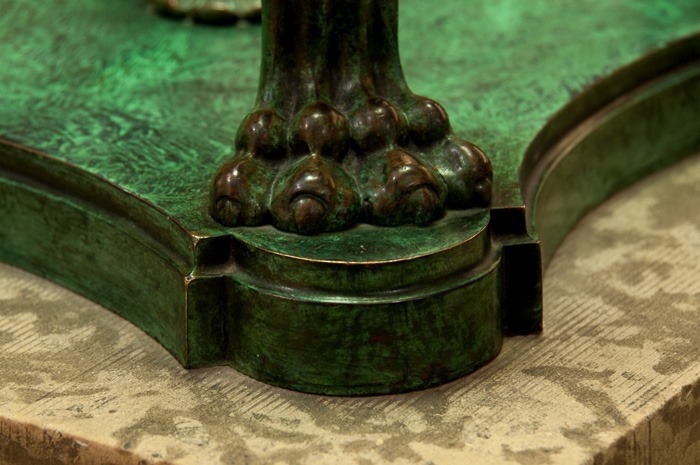 The feet of the fixtures? Decorated! Of course. Every fixture in the Legislature is “moving” softly as on cat’s paws. Lion’s paws are everywhere, with or without the claws. I am not sure if there is any significance to the showing of the claws in any particular place in the building. Again a successful outing with the Manitoba Foto Friends, even if I had seen the building already a few times before. 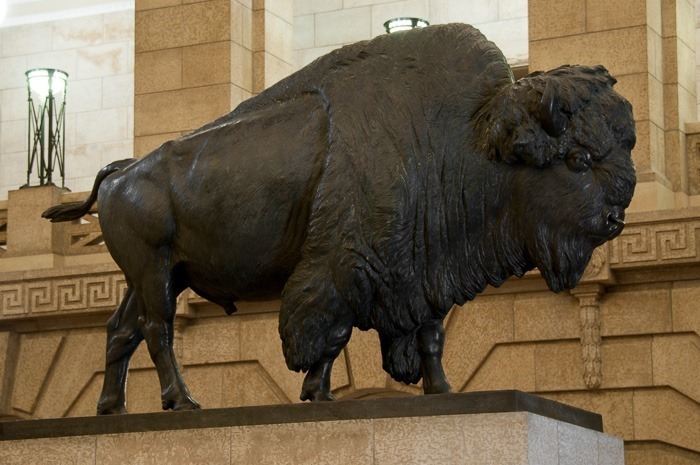 The Manitoba Legislature always remains interesting, however many times you come back there.